A 330 ml tea infuser mug made from dishwasher-safe ceramic. The stainless steel infuser is suitable for all loose-leaf teas. The KASSEL is a ceramic tea infuser mug for making loose-leaf tea one cup at a time. 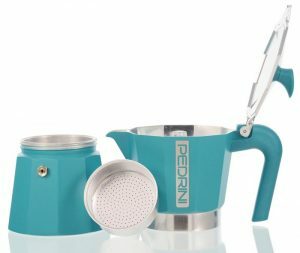 The fine stainless steel infuser can be used for both coarse and fine leaf teas. 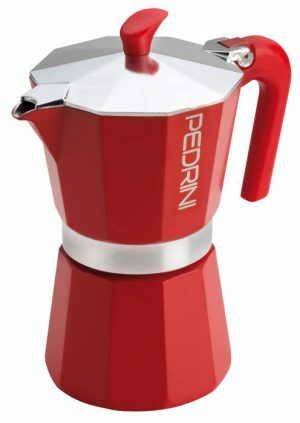 It is a large enough for the tea leaves to expand and give you a flavorful cup of fresh-brewed tea. You can easily remove the infuser when your tea has brewed. The ceramic stoneware mug is strong, durable and dishwasher-safe. 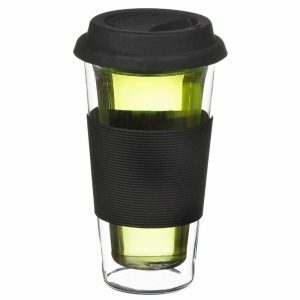 The lid will keep your tea warm while steeping and doubles as a coaster for your infuser when your tea is ready. 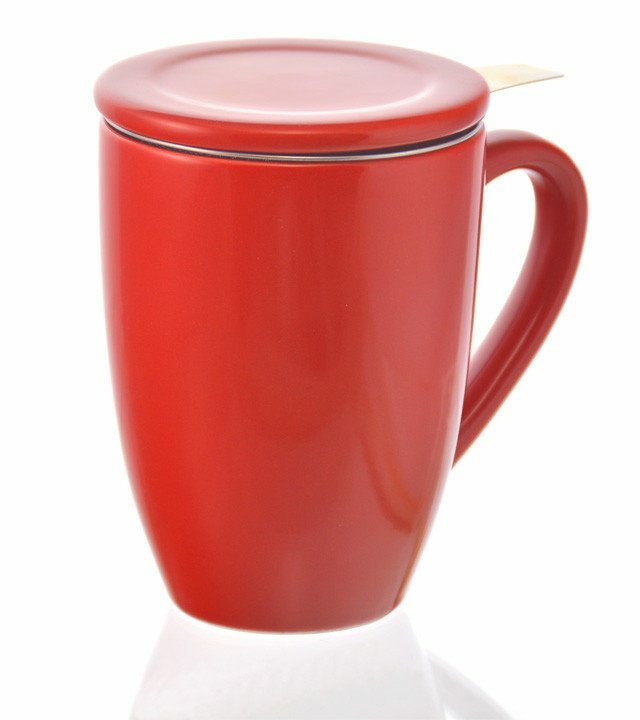 The tea mug is made of durable stoneware ceramic. 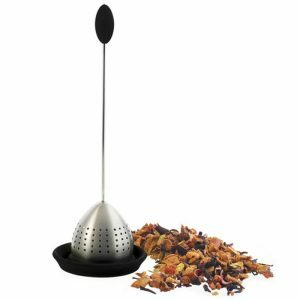 The tea infuser is made of 18-8 stainless steel. Stainless steel is also a long life material and wont break or rust. The cup comes with a lid as well. 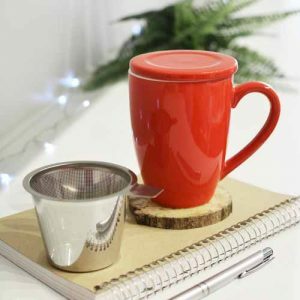 This tea infuser with lid will keep your tea warm as it steeps. Lets face it, who wants a lukewarm cup of tea? Why use a tea infuser cup? Infuser tea mugs are the way to go when you just want to make one cup of tea at a time and not a whole pot. The cups come with infusers, so you can easily steep your favorite tea. 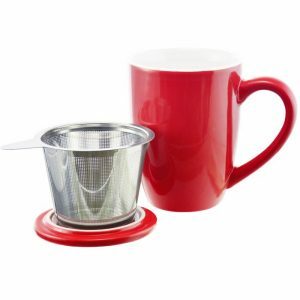 You can use the lid as a trivet for the tea leaves in the stainless steel tea infuser. 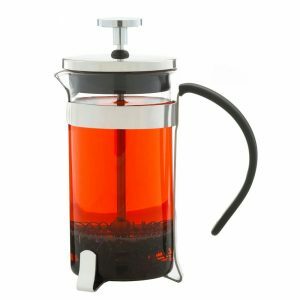 They are great for the office as well as for the home.You dont have to resort to the stale office tea bags, and can now enjoy your favorite loose leaf teas in your tea mug with its infuser. Simply place your favourite loose leaf tea leaves into the stainless steel infuser in your KASSEL ceramic tea infuser cup. Pour hot water over the leaves and cover it with the lid. Let your tea steep until it has reached the desired strength. Remove the lid and infuser and enjoy! The lid also doubles as a trivet for your infuser. How cool is that? What kinds of tea can I brew in this tea infuser cup? The infuser in the Kassel tea infuser mug is a fine laser etched stainless steel infuser. So you can brew many kinds of tea in it. that includes green teas, black teas, and herbal teas You can even brew teabags in the infuser and simply remove the infuser when the tea is brewed to make it easy to use. GROSCHE is able to provide 50+ days of safe drinking water to someone in need with your purchase of this mug. We are a Social Enterprise and certified B Corporation. Being a B-corp is a certification for businesses that share a mission to do good for the world. We are also recipients of B Corp’s “Best for the World” Award.